Dr. Douglas Graham is a lifetime athlete and advisor to world-class athletes and trainers from around the globe. Dr. Graham helps motivated athletes learn how to become injury free by using excellent mechanics, and how to improve their performance by improving their health and awareness, focusing primarily on nutrition and recovery techniques. When he first tried Vibrams more than a decade ago, he became an instantaneous convert, due to the improved foot mechanics they provide. For the last five years, he has worn Vibrams exclusively. “I used to sprain my ankles at least a few times each year, and had done so for decades. Since switching to Vibrams, I have not had one single ankle sprain,” says Dr. Doug. “In Vibrams, the foot mechanics are perfect, and the calf development is ideal,” he states. “Fives are similar to the highest quality driving gloves. Every step is a sensual experience." After eight years of training, Dr. Graham started coaching trampoline at age 13. All seven members of his 1980 team won national championships in age-group competition. Dr Doug participates in a wide variety of sports, including completing several ultra runs in Fives. 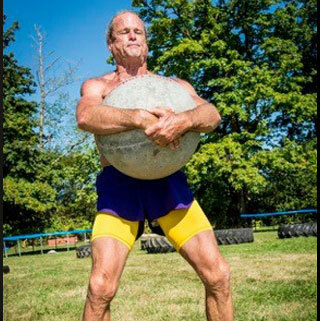 At 60, he took up powerlifting, and currently holds five regional records in the sport. When not wearing Fives, Dr Doug is barefoot. Dr. Graham is the author of ten books on health and fitness. Learn more about Dr. Graham’s products and programs at FoodnSport.com.